Manage Your Damn Money (MYDM) is a financial management show with attitude, urgency and creative flare. 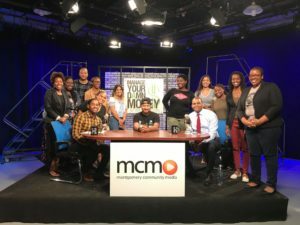 MYDM aims to inspire the conversation to move viewers to discuss and improve upon their personal finances and their understanding of the fiscal world. Ben Carter and Malcolm Ethridge co-host the show and believe personal finances aren’t that difficult and you don’t need to be a brain surgeon to understand how to manage your money. Their goal is to inspire day-to-day conversations about money and to connect financial advice to your everyday lives. The show includes musicians, artists, poets and a healthy balance of money professionals who will tell their stories to help you gain more confidence in what you know or should know about personal finances. Carter and Ethridge have moved production of their show to the television studios of Montgomery Community Media (MCM), an independent, nonprofit public access media organization. 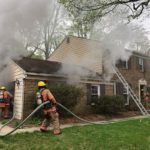 The show will be produced both as a television show and as a podcast at Montgomery Community Media’s flagship TV studios in Rockville. #MYDM: Is It Time for a New Kind of Capitalism? A booming economy and record low unemployment numbers are our current reality in 2018. But how can an economy be booming at the same time Americans are suffering from stagnant wages? How can we be seeing record highs in the stock market, while regular people are still feeling the squeeze of their day-to-day finances? In this episode of #MYDM, Ben & Malcolm discuss an interesting proposal which aims to shift the kind of American capitalism we’ve come to know. What are the implications behind Nike’s controversial ad campaign? What are the most sought after employee benefits for Millennials? And are Millennials really spending more on food than we are saving for our future? On this episode of #MYDM, Ben & Malcolm take a look at hot headlines as we exit this summer of 2018 and enter the fall, and rant about the NFL, also known as the “no fun league”. Pick your platform. Listen to this episode now! The cat is out of the bag. 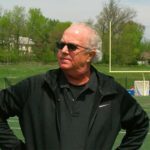 Manage Your Damn Money is entering the most long-term, most daunting and most expensive endeavor ANYONE can undertake. #Parenthood. How much will it cost for childcare? What about clothes? How about a simple (and cheap?) trip to your favorite fast food joint? Ben & Malcolm explore all the financial difficulties of raising children in America. And did we mention one of them is having triplets? It’s new. It’s digital. It’s all the rage… and very hard to explain or even understand. Cryptocurrency has become a hot topic over the last year or so, and in this episode, Manage Your Damn Money lifts its embargo on the subject inviting cryptocurrency enthusiast Samson Williams to debate whether or not Bitcoin and the crypto craze at large is B.S. Ben & Malcolm also discuss the implications of larger concentrations of the U.S. population living in fewer and fewer cities, as well as why tech executives like Bill Gates and Mark Zuckerberg DON’T let their kids use the platforms they created. Whether it’s a common cold or serious health condition, we all get sick and sometimes, getting sick costs money. On this episode of #MYDM, we explore the value of having comprehensive health insurance and what happens when you don’t have coverage. Ben & Malcolm also discuss whether or not Millennials are ready, or even financially capable of running to become an elected official in today’s America. Would you date someone who isn’t well established financially? Would you be okay if your woman was the breadwinner? Should you and your partner split bills 50/50 or according to who makes more? #MYDM tackles the subject of Love & Money, again. Those born in the 1980s and on are facing some unique financial challenges – student loans, income inequality, and the question of social security. #MYDM takes a look at the many factors affecting the pockets of the Millennial generation, and how we might be able to win despite a really bad hand of cards. Ben & Malcolm also take a look at the most imbalanced places in the United States when it comes to income inequality. What’s the worst financial advice you’ve ever been given? Who gave it to you? Was it your crazy Uncle Larry? Or wine-glass-always-in-hand Aunt Leslie? We take a look at the most ridiculous financial advice given to us and to our listeners. Ben & Malcolm also explore the reason why Papa Johns would be working so hard to get rid of its founder, John Schnatter. *Hint: It might be due to a mild to moderate case what doctors refer to as raging racism. 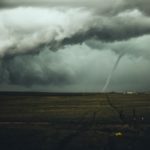 The result of an over inflated housing market, bad loans and good old American greed, we take a look back at the causes, aftermath and policy changes made as a result of The Great Recession of 2008. Ben & Malcolm also discuss a new trivia game show that wants to pay off your student loan debt. We’re currently devising a plan to ensure Ben can be a contestant on the show. Wondering how you can turn that lemonade stand into a world renowned beverage brand? Or at least how to make a few bucks from that moonlight activity you love? We explore what it takes to convert your side hustle into a full blown money-making enterprise with the Co-Founder of Very Smart Brothas, Panama Jackson. Ben & Malcolm also cover the fallout from ABC’s cancellation of Roseanne and welcome the show’s very first live, in-studio audience. Financial setbacks come in all shapes and sizes and never at a convenient time. But it’s important we all understand what has to happen when they hit and how to bounce back. Ben & Malcolm also discuss Amazon’s facial recognition technology and the arrival of the future world predicted by the Tom Cruise movie, Minority Report. What percentage of your income should you spend on rent? What percentage should you be saving? What will be left for transportation or groceries? We take a look at how much you should be spending on what when it comes to allocating your funds. Ben & Malcolm also discuss Congressman sleeping in their offices because the rent is too damn high, and Ben shares a recent realization that he could probably afford a luxury car if it weren’t for a certain monthly expense. In this episode of #MYDM, we take a look at recent money-related headlines you need to be aware of as we transition into peak tricking-off season. Ben & Malcolm also discuss the absurdity of going broke to attend weddings, while Malcolm shares the impact poor collegiate oral health is having on his present-day finances. In this episode of #MYDM, we explore the many different kinds of scams that have come and gone and share how you can protect yourself, your identity and your money from being taken advantage of on or offline. When you were a kid, a combo meal from McDonald’s would cost you no more than $5. Now, you can’t leave Mickey D’s without spending as much as you would on a Chipotle bowl with chips. Why? One word — Inflation. In this episode of #MYDM, we take a look at the effects of inflation on the cost of goods and on those working toward or already in retirement. Ben & Malcolm also share their views of an NCAA pay-for-play scandal. 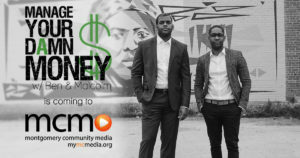 “Manage Your Damn Money (MYDM) is proud to announce the movement of production of Manage Your Damn Money with Ben & Malcolm to the television studios of Montgomery Community Media (MCM), an independent, nonprofit public access media organization. “Manage Your Damn Money will resume production of its podcast turned television show starting in February 2018. The show will be produced both as a television show and as a podcast at Montgomery Community Media’s flagship TV studio in Rockville, MD.